Senior guard Bailey Williams drives to the hoop against a Brown defender in the WBI quarterfinals. 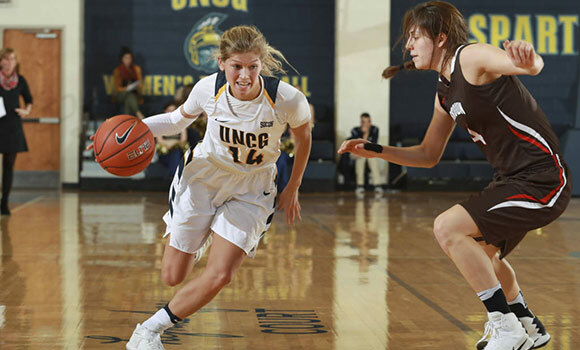 The UNCG women’s basketball team defeated Brown 87-84 on Sunday to advance to the semifinals of the 2017 Women’s Basketball Invitational (WBI). The Spartans, now 19-14, will host Milwaukee at 7 p.m. on Thursday, March 23, in Fleming Gym on campus. UNCG’s postseason run – its first since 2002 – is the perfect ending to what has been a historic season. In her first season as head coach, Patterson has led the team to its most wins since the 2006-07 season and was named Southern Conference Coach of the Year. Freshman guard Nadine Soliman was named SoCon Freshman of the Year, the first UNCG winner since the 2012-13 season. Soliman’s 16.2 points per game make her one of the nation’s top-scoring freshmen. Admission to Thursday’s semifinal matchup is free for UNCG students, faculty and staff with a valid ID. Tickers are $5 for adults and $3 for seniors (55 and older) and youth (12 and younger). Additionally, UNCG Athletics is offering free Barberitos burritos and chips to the first 200 fans. For more information and to stay up-to-date on women’s basketball, visit uncgspartans.com and follow UNCG Athletics on Facebook and Twitter.